The new Pixar movie Inside Out is largely set inside the head of the eleven year-old Riley. The emotions Fear, Anger, Sadness, Disgust and Happiness determine her behavior from the control room that is her brain. Are our actions determined by these emotions in reality? For the making of Inside Out, Pixar-director Pete Docter received scientific advice from emotion investigators Paul Ekman and Dacher Keltner. Paul Ekman is primarily known for his work on universal emotions from the 60s and 70s. He distinguished six basic emotions: fear, anger, sadness, disgust, happiness and surprise. With the exception of surprise, these emotions make up the main characters that reside inside the psyche of Riley. According to Ekman’s theory of emotion, the basic emotions are innate. Each emotion brings about a specific facial expression. 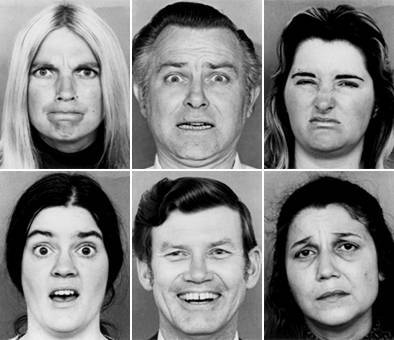 To find out how universal these six basic emotions are, Ekman presented photos of American actors portraying these emotions to his test subjects. The subjects then selected the basic emotion that they recognized in the picture. As it turned out, subjects from Brazil, Japan and Papua-New-Guinea often chose the emotion that the actors had intended to express, suggesting these basic emotions were transferable across very different cultures. Ekman’s emotions The basic emotions from Ekman’s experiment. Can you guess which emotion (fear, anger, sadness, disgust, happiness or surprise) is displayed in each picture? Over the last few years, considerable doubts have surrounded Ekman’s theory of universal emotion. Part of that criticism is aimed at the method Ekman used for his investigation. The actors on the photos that were used by Ekman displayed extremely exaggerated emotions. More recent research has brought to light that the rate of recognition of the basic emotions drops severely when they are portrayed in a more spontaneous and subtle manner. It is also reduced when the test is presented in the form of open-ended instead of multiple choice questions. Another point of criticism targets the universality of the basic emotions. Cultural heritage does appear to influence the way one experiences and recognizes emotions. In a recent study, members of the Himba tribe of Namibia were asked to categorize a set of photos into six groups. Although the Himba grouped cheerful, fearful and neutral facial expressions, photos displaying disgust, anger and sadness were not categorized as such. Finally, the number of basic emotions that we should distinguish is also hotly debated. Researchers from Glasgow argued for the distinction of four instead of six basic emotions: happiness, sadness, anger/disgust and fear/surprise. When test subjects observe animated pictures of faces expressing emotions, it turns out they cannot reliably tell the difference between anger and disgust, or fear and surprise. Meanwhile, Ekman himself proposed an expansion of the number of basic emotions in the 1990s, to include shame, satisfaction, contempt and pride. Whether basic emotions exist and how many we should distinguish remains unclear. The creators of Inside Out opted to keep the number of characters controlling Riley at a maximum of five to six. In the end, five (basic) emotions were sufficient to deliver an entertaining (and occasionally emotional) film. Answers: First row, from left to right: anger, fear, disgust. Second row, from left to right: surprise, happiness, sadness. This blog was written by Flora Vanlangendonck and can also be read in Dutch. Flora is pursuing a PhD at the Donders Institute, for which she is investigating how people take into account what knowledge their conversational partners do and do not possess.